HKN act B-red, has been hit with fraud allegations as some students of Olabisi Onabanjo University (OOU) have accused him of taking their money for an event he never performed at. Instagram user, @Classicdrock, said Bred charged students N1,000 for an otherwise free show at Olabisi Onabanjo University. 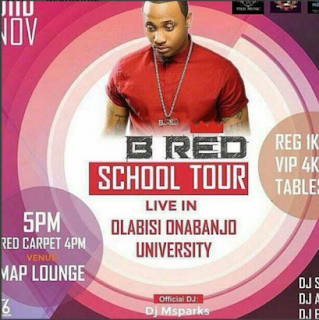 “@bredhkn U claim to be on campus tour, stating u are coming live to OOu Friday Nov.3, after students have purchased tickets (1000naira/head) , u showed up your yellow self just to come collect the money without performing, meanwhile u claim it was a campus tour which could have even be free but wasn’t so, and all you could do at the end was to scam oouites..